I am working on my Bow Tie Quilt. It’s been basted and a sample sandwich was made, so that I can try out machine quilting techniques. I am excited about this quilt. The colors dance and sparkle. Sewing the quarter circle blocks was great fun. 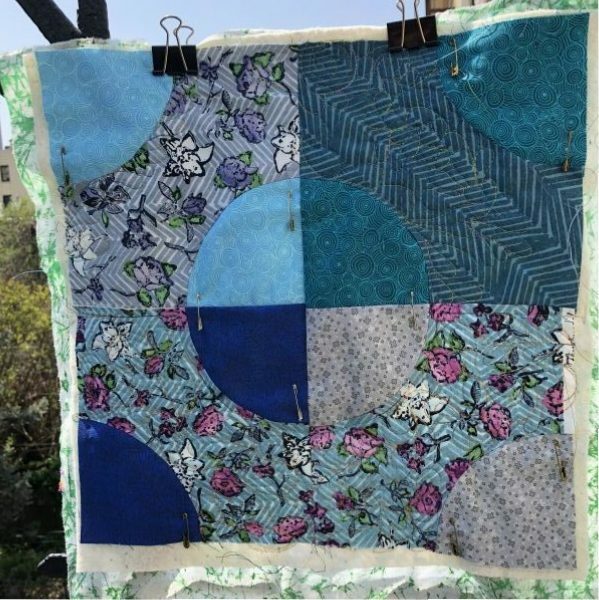 And now, this great quilt is encouraging me to machine quilt in ways that I have not recently explored. Usually, when I quilt my hand printed quilt tops, I machine quilt in straight lines, in order to ‘level the playing field’ and place the focus on the handprints rather than the quilting. Check out my Lace Swirl Quilt with straight line quilting, here. But, straight lines won’t do this time! I want to stretch and learn, which is in keeping with this Bow Tie Quilt top anyway. So this morning, I rounded up every spool of thread in the house and evaluated my stash. I posted to Facebook, asking about the different threads I rounded up and also, examples of free motion go-to shapes. (I love asking the folks on my feed for their advice! I get great information, differing views, links and photos! Book suggestions too!) Cindi G turned me onto Baptist Fan free motion shape, and Kevin S suggested renaming it Lava Flow, which I must say, I really like!! I have been to Hawaii, seen the volcano that recently erupted and I feel connected to its flow and outcome. I chose this thread and ‘Lava Flow’ or Baptist Fan, though I did need to purchase a large spool, I happily await its arrival. In the meantime, I will use up the spool I have. This is a bunch of fun! I am so in love with Floribunda and with your Bow Tie quilt. Have fun!